Nongnuch Village…beautiful kingdom in dreams. It is situated in km. 163 between Pattaya and Sattaheep after passing Pattaya about 10 minutes by drive. 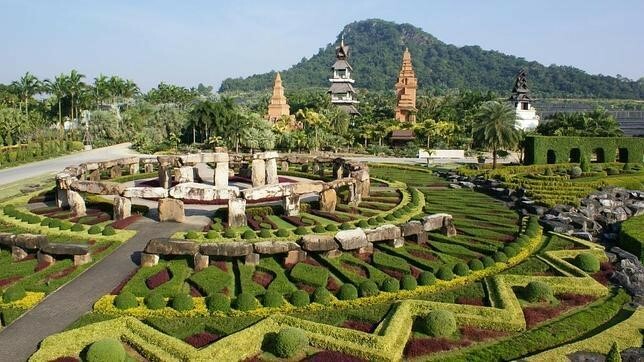 The first spot I gloated over is “ Khra Thang Garden,” which is the creation of sculptures with flowerpots amazingly arranged in different designs. After that, I crossed the road and bound for “ colorful pineapple orchard,” which does not produce the pineapple fruit but boasted the charm of its flower and dazzling and colorful leaves. There are over hundred breeds of plants of both local and imported from other countries such as Holland and Brazil. 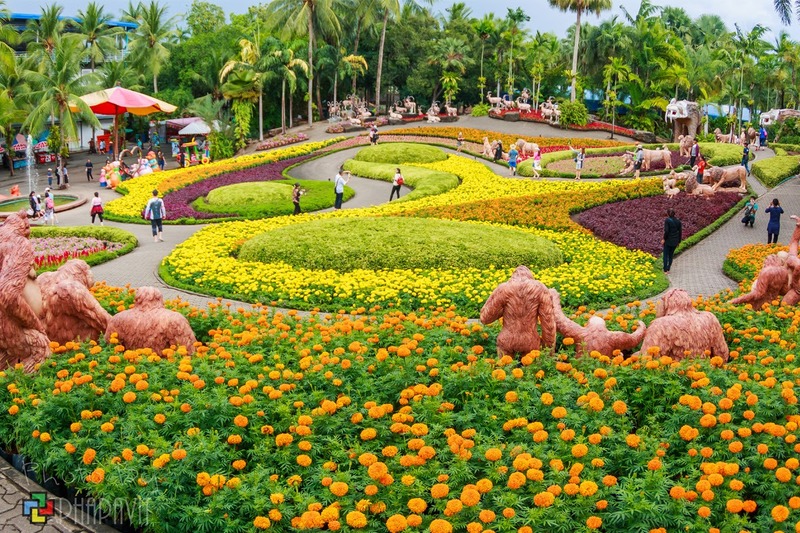 The decoration is the mixing between unique and natural gardening, sculpturing and fountain with easy listening music. The front section is “ orchid garden” with different types of orchids such as Vanda, terrestrial orchid and from around the world and mixing types especially Cathaliya, the new type that was bred by Nong Nuch. After passing the orchard arch, I had to look up on Buttom Tree, a type of palm tree with enormous size with shape like bottle standing in front of orchid arch. It was imported from Australia, so, its root is not yet strongly seized with the ground. Therefore, it needs to have a wire to seize the root with the ground. After that, I rode on car to enjoy the beauty of the scenery along the two paths. The car stopped at “sky bridge” and let me to enjoy the sight up high above as well as Bird Eye View that let me see the different sections of the gardens with the path length 1,130 meters. This idea is from Mr, Kampol that allow tourists to be closest to the nature. Walking along the bridge until reaching sight seeing pavilion. The front section is “ French garden,” which coppied the design of Versile palace in France with the area of 10 rai beyond the eye view. 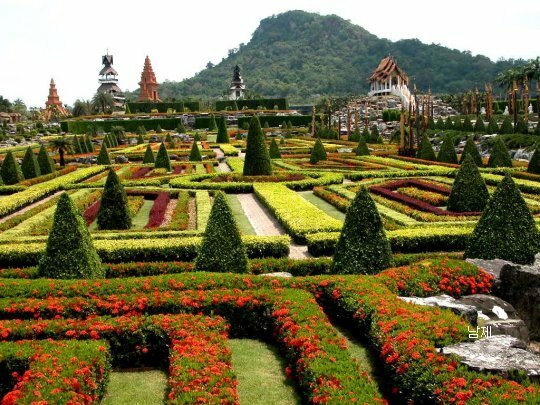 The French garden was designed with geometry shape of Japanese compass as the main line. A type of vegetable with its colourful floss stripe together with Urticaceae, banyan tree and Fujian tree are components of the decoration. The decoration is from very delicate designs which express readiness and skillfulness of the large garden, from those who created excellent work.